Heavy metal powerhouse HIGH ON FIRE releases a music video for its brand new single ‘Slave The Hive‘. The song, available as limited edition 7-inch at every stop of the group’s current Scion A/V-sponsored headlining tour, marks the first new music from the California metal champions since the spring 2012 release of De Vermis Mysteriis. And now, VICE‘s Noisey presents the world premiere of the ‘Slave The Hive‘ video. Check out the “terrifying” new video now at THIS LOCATION! 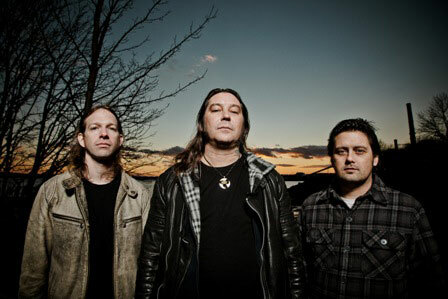 HIGH ON FIRE‘s North American headlining tour will run through December 12. Norwegian thrash-metal sextet Kvelertak opens all dates. HIGH ON FIRE just released the first official live recordings of its career with the two volume set ‘Spitting Fire Live’, which has been hailed as “high-volume intensity” by the Austin Chronicle, “hot as the infernos” by Pitchfork and a “documentation of the band’s undiminished ferocity onstage” by the SF Weekly. Recorded over a two evening NYC headlining stint at both NYC’s Bowery Ballroom and Brooklyn’s Music Hall of Williamsburg last winter, ‘Spitting Fire Live’ showcases HIGH ON FIRE at its incendiary best, containing songs from each of the band’s critically acclaimed studio albums including last year’s celebrated De Vermis Mysteriis and you can also read Mark’s review HERE.